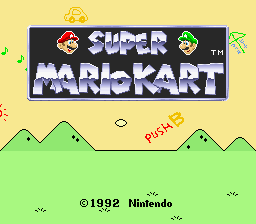 On the title screen, the logo box was enlarged, allowing the block letters to be spread out a bit more. Some of the letters were also redesigned slightly. Next, we'll isolate the scrolling background. The umbrella and Japanese "Mario Kart" lettering were removed, while the mushroom was moved up and to the left. Here's a close-up of the removed umbrella drawing, which has "マリオ" (Mario) and "ピーチ" (Peach) written underneath it. Similar to how in America we draw a heart and write two names inside it, Japanese sweethearts draw what's called an ai-ai gasa ("love-love umbrella"). Thanks: Ian F. and Patrick S.
Unlike the Japanese release, the U.S. version remembers your menu choices leading up to the racer select screen, and will have your previous choices already selected the next time you go through the menus. This change allows you to mash the B button to quickly choose the same game mode that you played last time. There were several changes to the trophy ceremony. 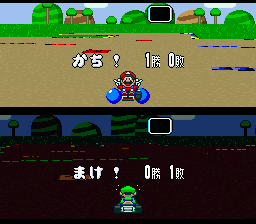 We'll start by pointing out that the Japanese version uses orange text for the type of race (e.g. 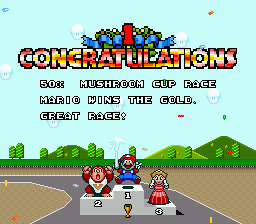 "50cc Mushroom Cup Race"), but it was changed to plain white text for the U.S. release. Another easy-to-see change here is the new ribbon graphic behind the big "congratulations" message in the U.S. version. If you finish in 1st place, the ribbon is blue. ...and a silver ribbon for taking 3rd. After earning a gold trophy, each driver has his or her own celebration animation involving one or more bottles of champagne. 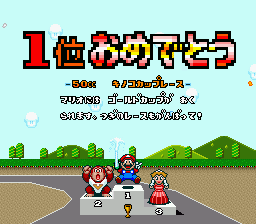 In the Japanese version, Bowser and Princess drink the champagne! However, alcohol usage went against Nintendo of America's content guidelines, so they gave Bowser and Princess new animations for the U.S. release. For the 2P results screen, the Japanese version stays consistent with the "Ranked Out!" 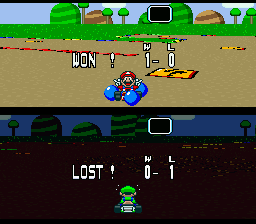 and "Game Over" screens by using a thick font, but the U.S. version uses its skinnier font here. The kanji next to the win/loss totals were removed in favor of "W" and "L" column headings. 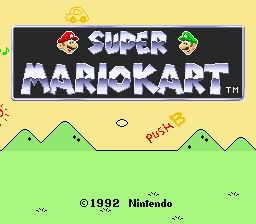 When Super Mario Kart was released, Peach was still known as "Princess Toadstool" in North America.